PLEASE NOTE THAT THIS IS NOT OUR MAILING ADDRESS. Our mailing address is located in the footer of the website. Thank you! Have a question? Call or Text us at : 905-260-5637 and we will get back to you asap! Why go to just any tack shop? 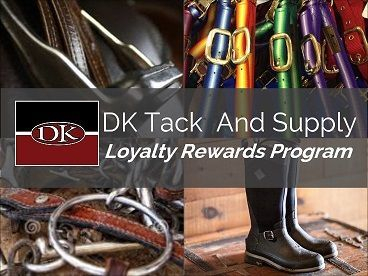 At DK Tack and Supply we offer our customers tried and tested products. We will not sell any product that we would not endorse. We are horse people. We understand your needs, whether you have a backyard baby or a high level performance horse. No one in our store works on commission - you will not get the hard sell to make a quick buck. We want you to be satisfied and help you get the product appropriate to your needs. We know that you get out of a horse, what you put into it. Our horses get the best - we know what the best is. Putting you, and your horse, first. Whether it be Horse Racing (our favorite!) Dressage, Eventing, Hunter Jumper, Reining, or Pleasure, we've got you covered! Love showing? 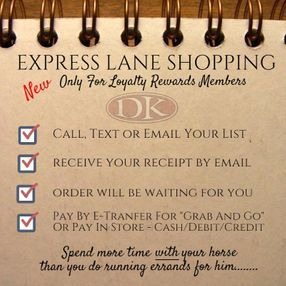 We carry all the items you'll need so you and your trusty steed can turn some heads the next time you are in the ring!